Put them all in the same picture, and someone’s head is likely to explode from the awesomeness. 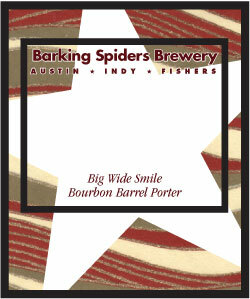 The newest brew from our very own Barking Spiders Brewery, Big Wide Smile Bourbon Barrel Porter, is nearly ready to be enjoyed. I snuck a sample yesterday evening, and it’s carbonating nicely, and already nice and smooth, with exactly the bourbon nose that I have loved ever since having my first bourbon barrel aged beer from Bluegrass Brewing Co. This recipe is based on Great Fermentations’ Porter Call Me A Taxi. To their recipe I added a few ounces of crushed unsweetened chocolate and a few ounces of whiskey barrel chips that I soaked in additional whiskey for a week. I fretted about where in the world I could find real whiskey barrel chips, but it turns out they’re very easy to get. 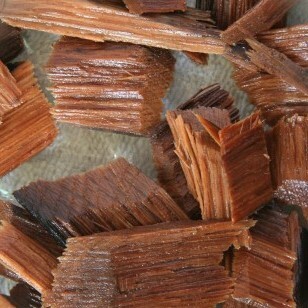 Jack Daniel’s sells wood chips from their whiskey barrels all over the place, for use in barbecue grills and smokers. I obviously didn’t use a whole bag for the homebrew, so we’re going to have some nice smoky ‘cue in the next few months. I am thinking specifically of a pork tenderloin with a cherry sauce. As a note for homebrewers wanting to brew with wood chips, be sure that your wood chips are fine enough. I was surprised to find that the chips continued to expand while they were in the carboy, and it was a close call with a few of the last chips trying to get them out of the narrow opening! We’ll be ready with a nice warming brew when fall really kicks in and gets cold. This one clocks in at 11% AVB! It was not my intent for this batch to be quite so strong, but warm us it will. The only question now is what to brew next? Emily is lobbying for another dark brew. A vanilla porter would be a fun experiment. We’ll have a couple weeks to think about it! After reading about two projects based on the Arduino microcontroller board, I’m really tempted to pick up my long‐postponed stop light controller project. The first project I saw was an elaborate modification of a Rancilio Silvia espresso machine, just like ours. This modification added a microcontroller, LCD display, and a software‐based PID temperature controller. To top it all off, the magic is controlled with a Wii nunchuck. The second project was a Tweeting Kegerator. What more description do you need to know that this is a truly inspired project? Each time the tap is pulled, a tweet is posted that tells the internal temperature, beer remaining, and number of pulls on that keg. Too fun!